When Maybelline asked me to create some nail art with the Color Show nail polishes I was left sweating. 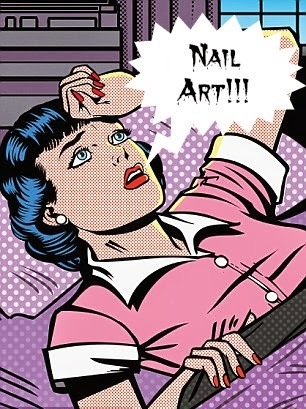 Like I have stated many times before I cant do nail art to save my life. I don’t have the patience or creativity for it honestly. Sometimes you end up looking at a tut and think that “oh that is easy….completely doable. I just to do a little this and a little that and voila I will have a beautiful butterfly down”…..A flower? No issues….will take a tooth pick and dot here and dot there and pull there and done! A regular Rembrandt. This is pretty straight forward. Before I go into the steps let me just tell you some pointers – a) don’t use brown tape as it leaves too much sticky residue and bits sticking when you peel it off. 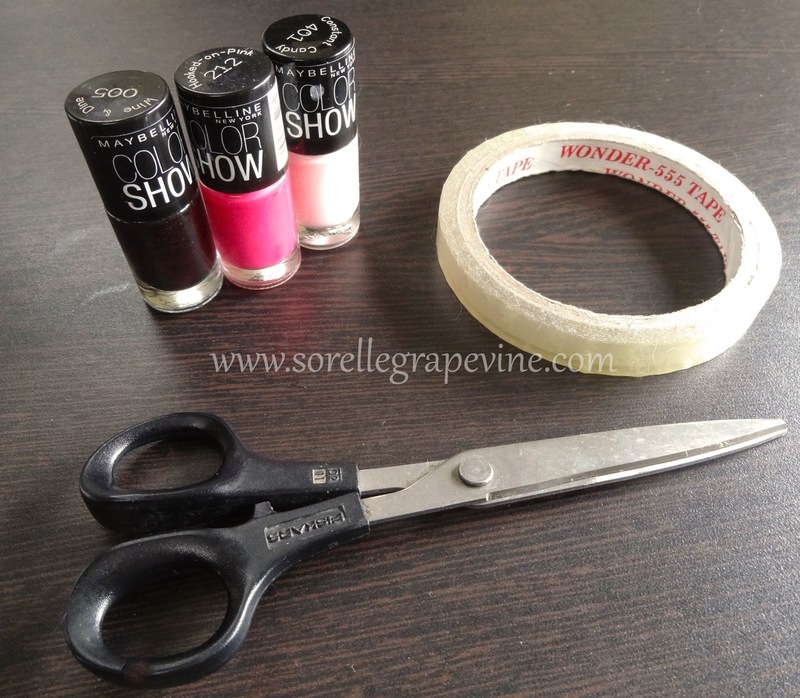 Stick to transparent, scotch or best alternative – surgical tape, b) don’t use tape on painted nail as some residue is left behind and the surface of the polish ends up looking weird with it at times acquiring marks. Haven’t tried the scotch or surgical tape so not sure if they have the same issue, c) don’t worry about making a mess as you can clean out and even make your lines symmetrical with a bud soaked in remover, d) take as little of the paint on the brush when doing the 2nd color. If you have too much paint on the brush it might spill or overlap the other color making a mess. Use little paint especially in the first coat and try to work around the edge of the 1st color as precisely as you can. This looks complex but is quite doable. We will need 2 strips of tape for this. 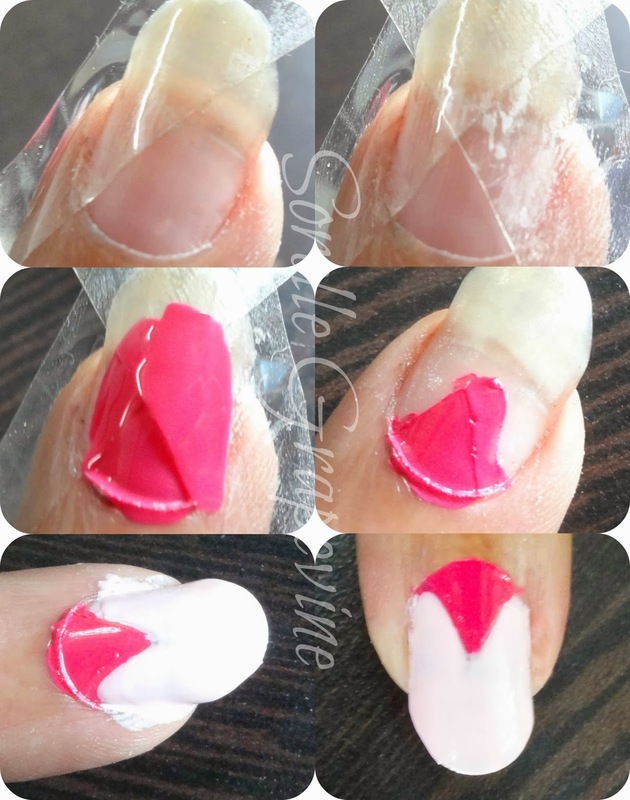 You can make the V or triangle at the base or tip of your nail. I’m doing it at the base. Place one strip diagonally. Think of the base of the triangle a part of the base of your nail. Now put the other strip across it diagonally all the while keeping an eye in the shape of the triangle. Adjust the 2nd strip if need be. Once you are satisfied with the shape press in down properly and apply 2 coats of your 1st color (you can see that I made a mess out of my triangle but I rectified it with the bud). Once it dries peel the tape one by one and then fill in the remaining space with 2 coats of the 2nd color. As the name suggests you will apply the strip diagonally across the nail. Try to ensure that it cuts across and divides the nail in half. Fill in 2 coats of the 1st color and let it dry. 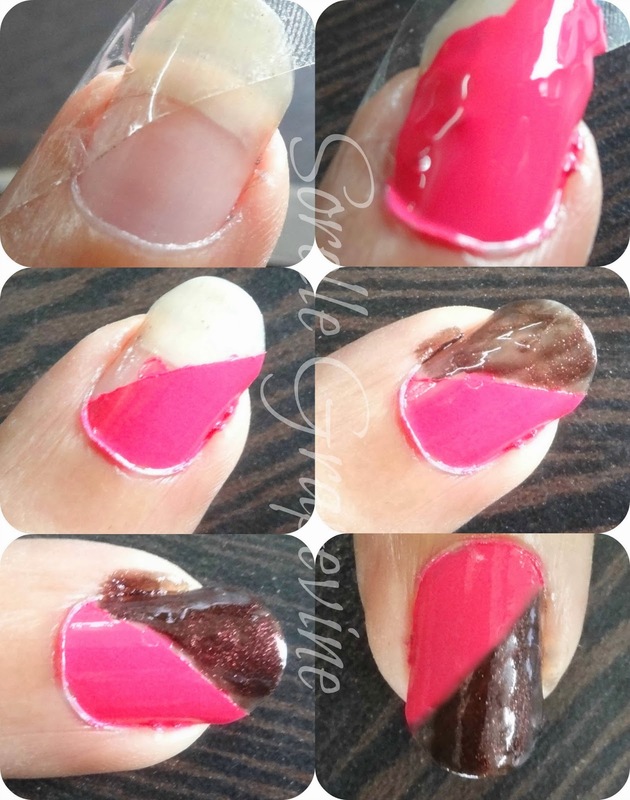 Peel the strip gently after it dries properly and then put in 2 coats of the 2nd color. Try to pull your brush down toward the tip rather than across to give it a better finish. 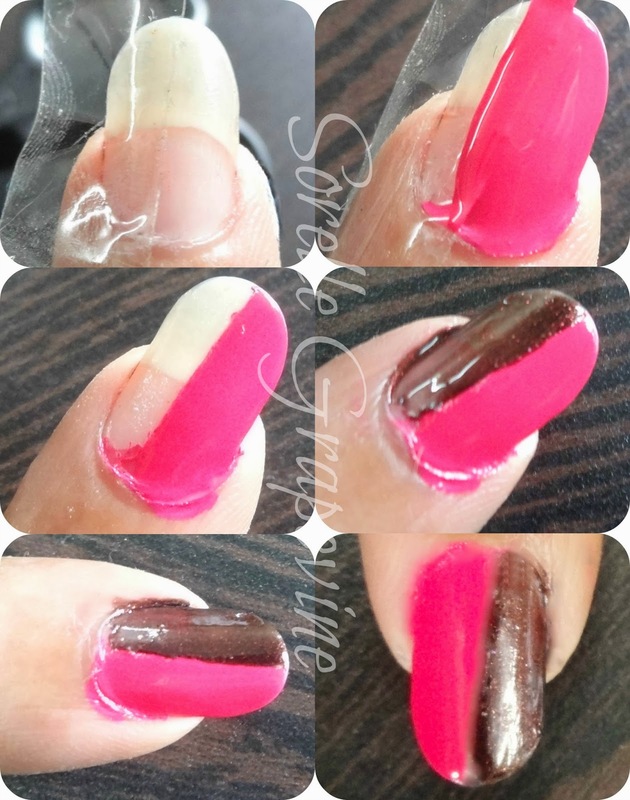 If you are not able to master the french tip with free hand and always end up with wonky lines then use this cheat method. 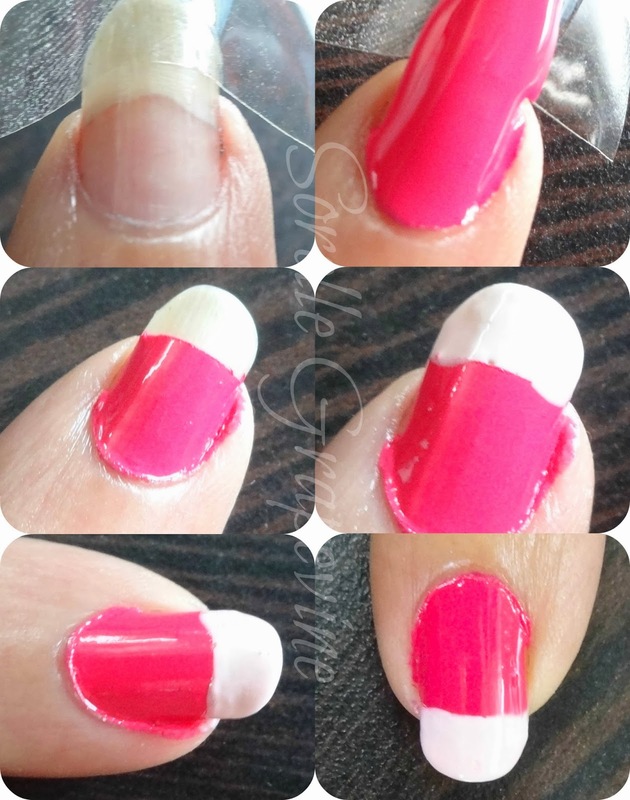 Cover the tip of the nail horizontally occupying as much area as you want to form the “tip”. Coat the remaining area with 2 coats and leave it to dry completely. Then gently peel this across and not down and put 2 coats of the 2nd color in the blank space. 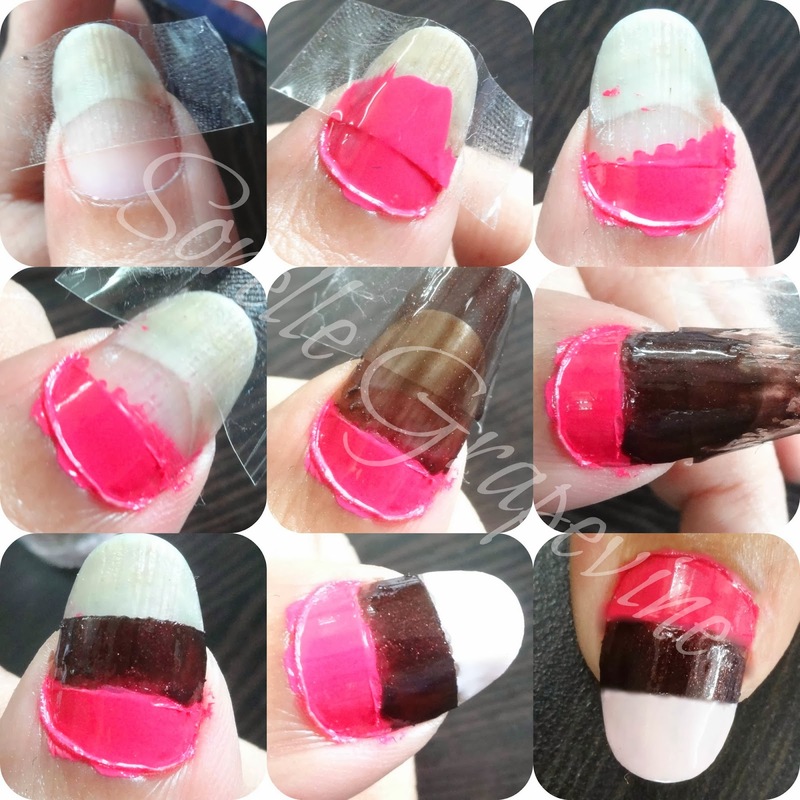 You can vary the the distance where you place the tape and make this into a horizontal nail art instead. A variant of the horizontal method shown above is to take it up a notch and introduce more colors into the mix. I’m taking a third one into the equation. I place the first strip after one third of my nail is left bare. Once that layer is done and dry I then cover the remaining 1/3rd with tape and coat on the 2nd color just above the 1st. In the end I use the 3rd color to finish off the stripes. This one is a little tricky but bit more creative. I combined 2 of the methods mentioned above to get a whole new design idea. My placement became a little off and in the end they didn’t turn out to be exactly what I had in mind but hey this was my first attempt at it so it was ok. Place a strip diagonally but leave lesser area uncovered than what I mentioned in the earlier diagonal method. Cover this, let it set and peel the tape of. Now using the diagonal line of the 1st paint as guide place the second strip of tape to make a triangle. Notice I did not overlap the paint with the tape. Fill the triangle with paint and leave to dry. Then peel off the strip and cover the remaining area with the 3rd color. If there are any gaps or irregularities with the lines try to cover them with the respective color but using a thin paint brush. You can dress them with stones or use paints having different finishes or textures or even top them off with glitter paints or break out your stamping kit (shudder). Once you get the basics it just depends on how far your imagination or patience takes you 🙂 I have used 3 colors from Maybelline – Wine & Dine, Hooked on Pink and Constant Candy. To give a spin to the pattern use those hole protectors that you get to protect punched paper. Basically they are a donut shaped strip of tape that you are supposed to put around a punched hole to prevent the paper from tearing due to constant use. They can be used to make semi circular or circular designs. I will try to get my hands on some and maybe do that in the next nail art post. Hope you found this tutorial to be useful. Please do leave your feedback. I will see you soon….Bye!